Internationally, the team has won a total of 22 international titles, with 18 recognized by FIFA and CONMEBOL. According to that, Boca is ranked second in the world for number of international titles won, together with A.C. Milan and behind [Real Madrid] and Al Ahly Sc with 20 titles. 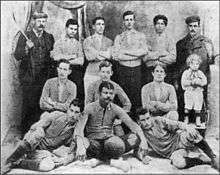 Boca Juniors' international achievements also include Tie Cup, Copa de Honor Cousenier and Copa Escobar-Gerona, organized jointly by the Argentine and Uruguayan Associations. Boca Juniors is also one of only eight teams to have won CONMEBOL's treble. 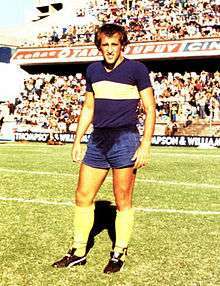 Their success usually has Boca ranked among the IFFHS's Club World Ranking Top 25, which they have reached the top position six times (mostly during the coaching tenure of Carlos Bianchi). Boca was also named by the IFFHS as the top South American club of the first decade of the 21st century (2001–2010). Boca Juniors is also known to be the one of the most popular football clubs in Argentina, along with River Plate. Boca juniors is one of the most popular clubs in South America. Boca has always had a fierce rivalry with River Plate, as both clubs were established in La Boca. 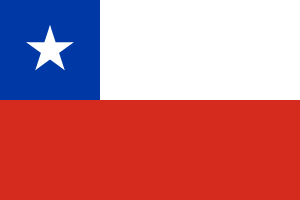 Matches between them are known as the Superclásico, and are one of the most heated rivalries in Argentina and the world, as both clubs are the two most popular in the country. 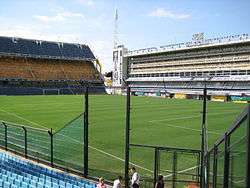 Boca's home stadium is Estadio Alberto J. Armando, which is colloquially known as La Bombonera. The youth academy has produced many Argentine internationals such as Sebastián Battaglia, Nicolás Burdisso, Carlos Tevez, Éver Banega, and Fernando Gago, who have played or are playing for top European clubs. 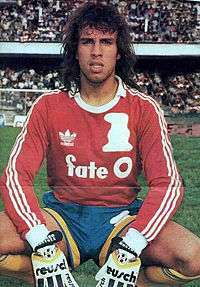 ↑ Released as a 3rd uniform, it was the first time Boca Juniors wore a black jersey. 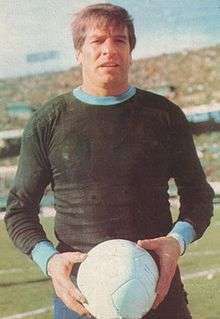 Although President of the club, Daniel Angelici, had stated that the black kit would never be worn, the kit debuted in a match v. Tigre, only four days after the announcement. 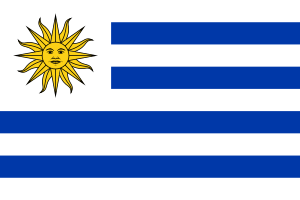 1 2 Established by the Argentina, Uruguay and Rosario Football Associations before CONMEBOL was created. ↑ "IFFHS Club World rankings statistics". Iffhs.de. Retrieved 5 May 2013. ↑ "South America's Club of the 1st Decade of the 21st Century (2001–2010)". IFFHS.de. Retrieved 15 February 2011. ↑ "El Club: Historia at Boca Juniors official website". Bocajuniors.com.ar. Retrieved 5 May 2013. ↑ "RSSSF Argentine divisional movements". Rsssf.com. 6 December 2006. Retrieved 5 May 2013. 1 2 3 "La camiseta at Boca Juniors official site". Bocajuniors.com.ar. Retrieved 27 July 2013. ↑ Vaca, =Javier; Lodise, Sergio. "La camiseta rosa". Revista del CECAD #3 February 2013. Calameo.com. Retrieved 5 May 2013. ↑ Georgina Turner and James Dart (23 November 2005). "Turner, Georgina & Dart, James. "Nicking the shirts off their backs," ''The Guardian'' (London, UK), Wednesday 23 November 2005". Football.guardian.co.uk. Retrieved 5 May 2013. ↑ "¿Cómo vamos a querer jugar contra River si ellos están en la B? – PlayFútbol". Playfutbol.infobae.com. 10 February 2012. Retrieved 5 May 2013. ↑ Dinamic Studio, Diseño y desarrollo de sitios web. www.dinamicstudio.com. "Banco Francés será sponsor de Boca Juniors y negocia la vuelta del Superclásico – País". impulsonegocios.com. Retrieved 5 May 2013. ↑ "Boca Juniors official website: crests". Bocajuniors.com.ar. Retrieved 5 May 2013. ↑ "Boca Verense site". Web.archive.org. 23 October 2007. Archived from the original on 23 October 2007. Retrieved 5 May 2013. 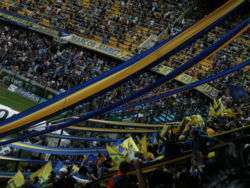 1 2 "La Pasion Boca-Boca and their stadiums" (in Spanish). Lapasiondeboca.com. Retrieved 5 May 2013. 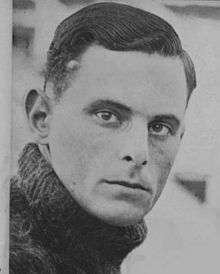 ↑ "RSSSF Argentina 1915". Rsssf.com. Retrieved 5 May 2013. ↑ "Midfield Dynamo stadium profiles". Midfielddynamo.com. Retrieved 5 May 2013. ↑ Usborne, David (19 January 2011). "Independent article". London: Travel.independent.co.uk. Retrieved 5 May 2013. ↑ Vickery, Tim (2 October 2006). "Tim Vickery Column BBC Football". BBC News. Retrieved 5 May 2013. ↑ "ESPN Deportes statistics". Espndeportes-akamai.espn.go.com. Retrieved 5 May 2013. ↑ "Adiós, "Raulito"" (in Spanish). infobae.com. 1 May 2008. Retrieved 27 May 2008. 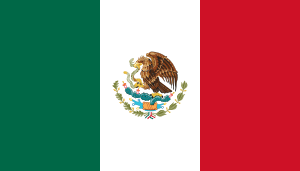 ↑ "see comment by senomar1234 23 June 2007 18:44:25". Taringa. 23 June 2007. Retrieved 5 May 2013. ↑ "Clarín Article" (in Spanish). Clarin.com. 18 February 2006. Retrieved 5 May 2013. ↑ "Article" (in Spanish). Canaltrans.com. Retrieved 5 May 2013. ↑ "Mobsters and hooligans; The identity construction of the barra brava of Boca Juniors in the Buenos Aires neighbourhood La Boca". universiteit utrecht. Retrieved 4 April 2014. ↑ Barrionuevo, Alexei; Newbery, Charles (26 November 2011). "In Argentina, Violence Is Part of the Soccer Culture". The New York Times. Retrieved 4 April 2014. ↑ "Argentina: 'Barras Bravas,' the soccer mafia". infosurhoy.com. Retrieved 4 April 2014. ↑ Laura Vidal, Venezuela (19 September 2010). "See La 12 and La Bombonera section". Globalvoices.org. Retrieved 5 May 2013. ↑ Labaton, Dana; Szerman, Luli (March 2003). "Club Atlético Boca Juniors – Los bosteros de la rivera" (in Spanish). Piedra Libre. Archived from the original on 15 March 2008. Retrieved 21 June 2008. ↑ "Cómo viajó "La 12" a Japón y logró ingresar al estadio olímpico de Tokio" (in Spanish). MDZ Online. 12 December 2007. Retrieved 21 June 2008. 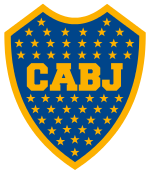 ↑ "Boca Juniors Considers Starting an MLS Expansion Team". theoffside.com. 31 July 2007. Retrieved 21 June 2008. ↑ "BBC Academy, famous football derbies". Newssearch.bbc.co.uk. Retrieved 5 May 2013. ↑ "50 sporting things you must do before you die". London: Observer.guardian.co.uk. Retrieved 5 May 2013. ↑ "Los jugadores que más partidos jugaron (Top 150)". historiadeboca.com.ar. Retrieved 1 March 2011. ↑ "Los jugadores con más goles marcados (Top 50)". historiadeboca.com.ar. Retrieved 1 March 2011. 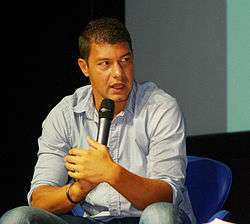 ↑ "Pieralini, Máximo". historiadeboca.com.ar. Retrieved 26 October 2010. ↑ "Taggino, Francisco". historiadeboca.com.ar. Retrieved 3 October 2010. ↑ "Bertolini, Enrique". 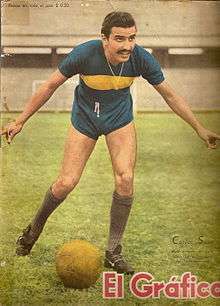 historiadeboca.com.ar. Retrieved 3 October 2010. ↑ "Elli, Alfredo". historiadeboca.com.ar. Retrieved 9 November 2010. ↑ "Garasini, Alfredo". historiadeboca.com.ar. Retrieved 27 September 2010. ↑ "Bozzo, Pablo". historiadeboca.com.ar. Retrieved 9 November 2010. ↑ "Busso, Mario". historiadeboca.com.ar. Retrieved 3 October 2010. ↑ "Kuko, Esteban". historiadeboca.com.ar. Retrieved 3 October 2010. ↑ "Moreyras, Gerardo". historiadeboca.com.ar. Retrieved 3 October 2010. ↑ "Penella, Donato". historiadeboca.com.ar. Retrieved 3 October 2010. ↑ "Marante, José Manuel". historiadeboca.com.ar. Retrieved 9 November 2010. ↑ "Vacca, Claudio". historiadeboca.com.ar. Retrieved 9 November 2010. ↑ "Ibáñez, Segundo Gregorio". historiadeboca.com.ar. Retrieved 2 October 2010. ↑ "Diano, Obdulio". 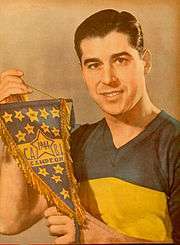 historiadeboca.com.ar. Retrieved 3 October 2010. ↑ "Dezorzi, Rodolfo Justo". historiadeboca.com.ar. Retrieved 3 October 2010. ↑ "Otero, Héctor Raúl". historiadeboca.com.ar. Retrieved 3 October 2010. ↑ "Busico, Marcos Ricardo". historiadeboca.com.ar. Retrieved 3 October 2010. ↑ "González, Herminio Antonio". historiadeboca.com.ar. Retrieved 9 November 2010. ↑ "Colman, Juan Carlos". historiadeboca.com.ar. Retrieved 9 November 2010. 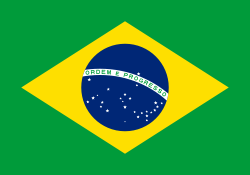 ↑ "Borello, José". historiadeboca.com.ar. Retrieved 27 September 2010. ↑ "Edwards, Federeico Roberto". historiadeboca.com.ar. Retrieved 8 November 2010. ↑ "Rodríguez, Juan José". historiadeboca.com.ar. Retrieved 2 October 2010. ↑ "Nardiello, Osvaldo". historiadeboca.com.ar. Retrieved 3 October 2010. ↑ "González, Alberto Mario". historiadeboca.com.ar. Retrieved 9 November 2010. ↑ "Silveira, Alcides Vicente". historiadeboca.com.ar. Retrieved 3 October 2010. ↑ "Pianetti, Oscar Antonio". historiadeboca.com.ar. Retrieved 9 November 2010. ↑ "Madurga, Norberto Rubén". historiadeboca.com.ar. Retrieved 27 September 2010. ↑ "Novello, Nicolás". historiadeboca.com.ar. Retrieved 3 October 2010. ↑ "Ovide, Armando Oscar". historiadeboca.com.ar. Retrieved 9 November 2010. ↑ "Ponce, Ramón Héctor". historiadeboca.com.ar. Retrieved 27 September 2010. ↑ "Nicolau, Miguel Alberto". historiadeboca.com.ar. Retrieved 14 October 2010. 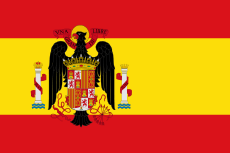 ↑ "Sánchez, Rubén Omar". 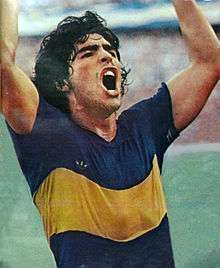 historiadeboca.com.ar. Retrieved 9 November 2010. ↑ "Rogel, Roberto Domingo". historiadeboca.com.ar. Retrieved 9 November 2010. ↑ "Coch, Jorge". historiadeboca.com.ar. Retrieved 3 October 2010. ↑ "Medina, Orlando José". historiadeboca.com.ar. Retrieved 20 October 2010. ↑ "Peracca, Rubén". historiadeboca.com.ar. Retrieved 3 October 2010. 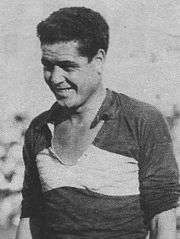 ↑ "Alves, Abel Aníbal". 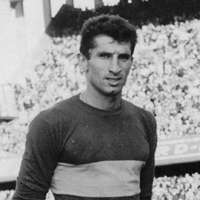 historiadeboca.com.ar. Retrieved 14 October 2010. ↑ "Ribolzi, Jorge Daniel". 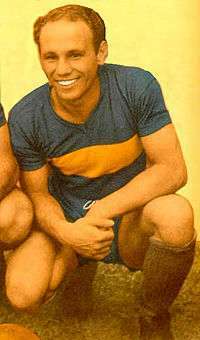 historiadeboca.com.ar. Retrieved 27 September 2010. 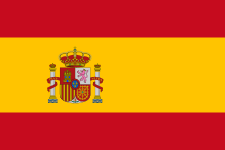 ↑ "Suárez, José María". historiadeboca.com.ar. Retrieved 3 October 2010. 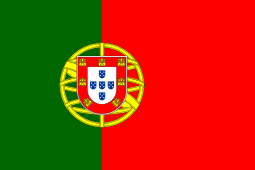 ↑ "Alves, Hugo César". historiadeboca.com.ar. Retrieved 20 October 2010. ↑ "Perotti, Hugo Osmar". historiadeboca.com.ar. Retrieved 20 October 2010. ↑ "Córdoba, Carlos Héctor". historiadeboca.com.ar. Retrieved 9 November 2010. ↑ "Krasouski, Ariel José". historiadeboca.com.ar. Retrieved 8 November 2010. ↑ "Passucci, Roberto Aníbal". historiadeboca.com.ar. Retrieved 9 November 2010. 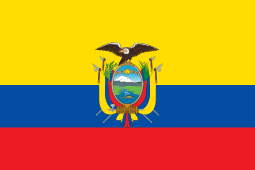 ↑ "Carrizo, Fabián Gustavo". historiadeboca.com.ar. Retrieved 9 November 2010. ↑ "Stafuza, Ivar Gerardo". historiadeboca.com.ar. Retrieved 9 November 2010. ↑ "Hrabina, Enrique Oscar". historiadeboca.com.ar. Retrieved 9 November 2010. 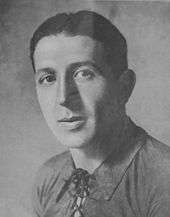 ↑ "Villareal, José Luis". historiadeboca.com.ar. Retrieved 26 October 2010. ↑ "Pico, Walter Reinaldo". historiadeboca.com.ar. Retrieved 9 November 2010. ↑ "Marchesini, Víctor Hugo". historiadeboca.com.ar. Retrieved 3 October 2010. ↑ "Moyá, Carlos Daniel". 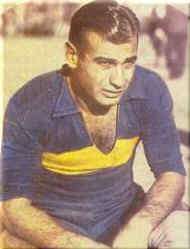 historiadeboca.com.ar. Retrieved 3 October 2010. ↑ "Boca Juniors official website:Executive Board". Bocajuniors.com.ar. Retrieved 5 May 2013. ↑ "Falleció Pedro Pompilio" Archived 2 November 2008 at the Wayback Machine. ↑ "Ameal, the new president"
↑ "Il Boca è campione. Angelici presidente". Corriere dello Sport. 5 December 2011. Retrieved 17 January 2012. ↑ Honor Cup at RSSSF.com Archived 17 October 2012 at the Wayback Machine. ↑ Argentina – List of Topscorers Archived 8 June 2009 at the Wayback Machine. 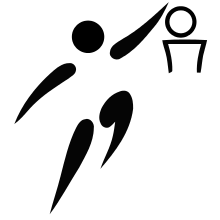 ↑ "Liga Nacional de Básquet – Boca Juniors" (in Spanish). LNB.com.ar. Retrieved 17 September 2009. ↑ "El Básquetbol de Boca Juniors" (in Spanish). Bocajuniors.com.ar. Retrieved 17 September 2009. ↑ "SUPLE GOLAZO!". Diario El Heraldo. Retrieved 1 August 2010. ↑ "Deportes". Boca Juniors official website. Retrieved 1 August 2010. 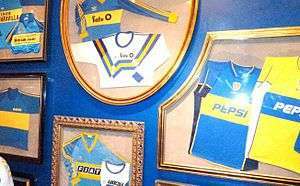 ↑ "Boca Juniors Restaurant". Retrieved 14 March 2012.